Aridity is the defining characteristic of the American West, and scientists reported Friday that the region is becoming even more arid due to human-caused climate change, putting states like Nevada at greater risk of water shortages, extreme wildfire, habitat loss and heat waves. The National Climate Assessment, a 1,656-page report prepared by 13 federal agencies on Friday, painted a stark future in which prolonged droughts could create water insecurity in basins across the Southwest should policymakers not act to mitigate future climate change and adapt to changes already underway. In addition to causing disruption to everyday life, climate change in the Southwest is expected to affect industries like agriculture and ranching. Nevada, the most mountainous state in the contiguous U.S. and the seventh largest state by area, straddles several ecosystems that would likely be harmed by hotter temperatures and changes to precipitation. Many of these early effects are already apparent, the report noted. In the past two years alone, northeastern Nevada saw the state’s largest single fire while Southern Nevada saw an increase in heat-related deaths amid record-breaking summer temperatures. “These are alarm bells that are going off right now,” said David Breshears, a University of Arizona ecologist and a report co-author, pointing to extreme wildfires and water shortages across the region. 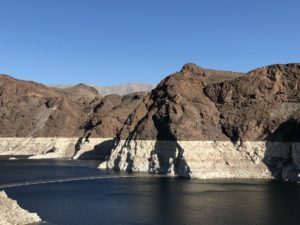 The report cited dropping water levels at Lake Mead, the reservoir created by the Hoover Dam about 30 miles from Las Vegas, as a prime example of how climate change has affected regional water supplies. Lake Mead, the largest reservoir on the Colorado River system, stores water for millions of Americans and hundreds of farms downstream in Southern Nevada, California and Arizona. Since the nearly two-decade drought began in 2000, the snowpack-fed reservoir has lost about 60 percent of its water because of overuse and arid conditions worsened by climate change. A paper released earlier this year showed that Colorado River streamflow has decreased by about 15 percent over the past 100 years with half of those decreases attributed to higher temperatures. 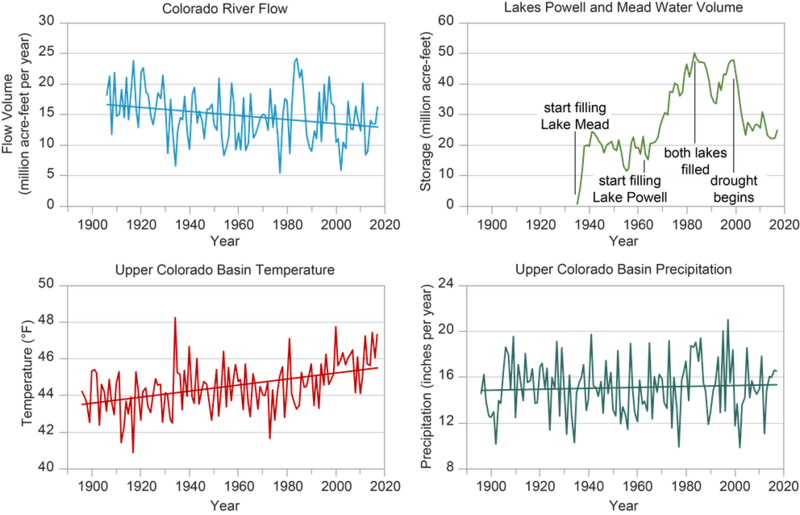 Declines in Colorado River flow and key reservoirs during the nearly two decade drought (National Climate Assessment). The seven states that fall within the Colorado River Basin, including Nevada, have been working on a short-term drought plan to voluntarily decrease water consumption in an effort to stabilize the reservoir. But the negotiations hit turbulence earlier this month with competing interests in Arizona arguing over how to move forward with a plan many hoped would be done this year. Climate change’s effect on water supply is not only limited to Southern Nevada, home to most of the state’s population. It is a statewide issue. Precipitation changes are expected to affect the Sierra Nevada, where snowpack melts into the Truckee River which runs through Reno, and the mountain ranges that supply the Humboldt River which snakes through Northeastern Nevada. Both water sources are key to the regional economy. Warmer storms do not translate into less snow every year. In some places in Nevada, it might mean more extreme weather, intense swings between wet and dry years. But scientists who study the West have observed consistent changes to how snow has fallen, and more importantly, what those changes mean for how much water melts into rivers and can be stored for human use. 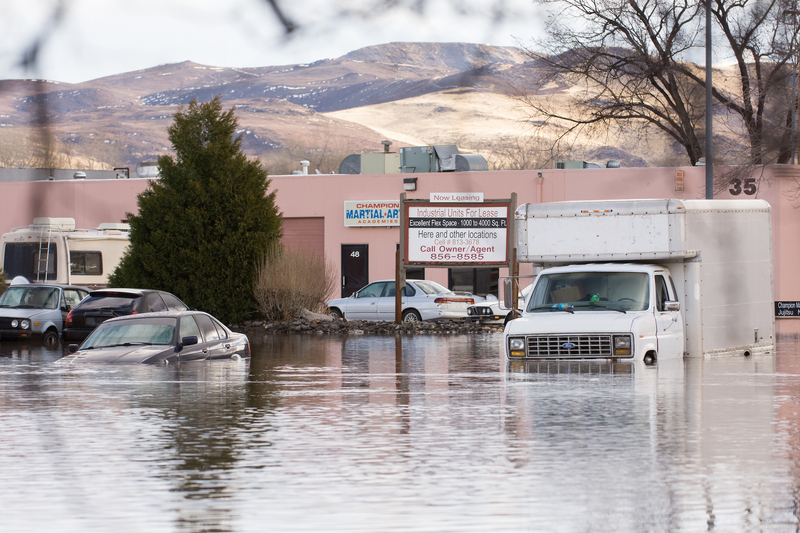 Flooding along the Truckee River in January 2017 (David Calvert/The Nevada Independent). Some scientists avoid calling this a “new normal.” Several have noted that climate change is a continual process, and symptoms apparent today are expected to worsen, according to scientific models. Each National Climate Assessment forecasts the future effects of climate change based on models that look at a spectrum of greenhouse gas emission scenarios. Gregg Garfin, an associate professor who studies climate at the University of Arizona and is an author of the report’s section on the Southwest, said the Earth is most closely tracking the high emission scenario. Climate models project that average annual temperatures across the Southwest will increase by about 8.6 degrees fahrenheit by 2100. That will be in addition to temperature increases that have already occured over the last several decades. For three consecutive years, Las Vegas has seen record high summer temperatures, The Nevada Independent reported in September. Garfin said climate change, in many parts of the West, is becoming a chronic issue. “What we are seeing happen over the years is this kind of transition from climate-related nuisances to climate-related problems,” Garfin said in an interview on Monday. This map shows the difference between average temperatures in the Southwest from 1986-2016 and average temperatures between 1901-1960 (National Climate Assessment). Not only could climate change create more megadroughts, it could also increase the occurrence of staggering heat waves, raising mortality risk and creating more air pollution, the report said. Some of these issues are already playing out. This summer, the Southern Nevada Health District reported a doubling of heat-related deaths in 2017 compared to the year prior. Garfin stressed that no one climate-related problem can be viewed individually. He said there is a nexus between climate changes’ effects on water, heat, public health and extreme wildfire. Changes in the water cycle don’t affect only the water supply. They can also contribute to more intense wildfires. A drier climate has left forests and other landscapes more susceptible to wildfire. The report found that between 1984 and 2015, the area scorched by fire was twice what it would have been without climate change during that period. More than one million acres have burned this year in Nevada because of wildfire, more than half in one fire — the largest single fire in state history. Although it’s difficult to trace climate change to a singular event, drier conditions in the range, in addition to forest management practices, have contributed to more extreme wildfire behavior. 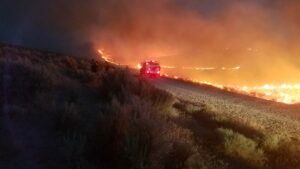 In recent years, wildfire in the Great Basin, the wider region most of Nevada occupies, has threatened ranches, burned grazing land and threatened wildlife habitat for the sage grouse and mule deer. The report noted that it has also made it easier for invasive species, like cheatgrass, to thrive. The report also found that the impacts of climate change can be worse for indigenous communities in the West whose reservations were often placed in the driest locations and remain restrained to set boundaries. As ecosystems adapt because of climate change, culturally-significant species found on reservations may no longer be able to survive there. The report specifically mentions the threat of climate change to the Pyramid Lake Paiute tribe outside of Reno. If runoff in the Truckee River decreases flows into Pyramid Lake, the result could be a decrease in habitat for the cui-ui fish, a culturally-important resource for the tribe. Beth Rose Middleton, a University of California, Davis researcher focusing on Native American studies, said that human-caused climate change will only amplify the way that modern society has manipulated nature by building massive dams and diverting water to faraway urban areas. “If you add into the mix climatic change, you have ever-increasing impacts,” she said. The report found that between 1984 and 2015, the area scorched by fire was twice what it would have been without climate change (National Climate Assessment). Despite the National Climate Assessment’s calculation that the impacts of climate change could curb the country’s gross-domestic product by 10 percent by the end of the century, President Donald Trump on Monday said “I don’t believe” the predictions around the economic impacts. Scientists slammed the president, noting that science is not a thing you can “believe” in like religion. The study issued by his own administration, they said, is based on verifiable evidence. Brad Udall, a co-author of the assessment and a researcher at Colorado State University, stressed the importance of addressing the issue of aridification and not getting distracted. 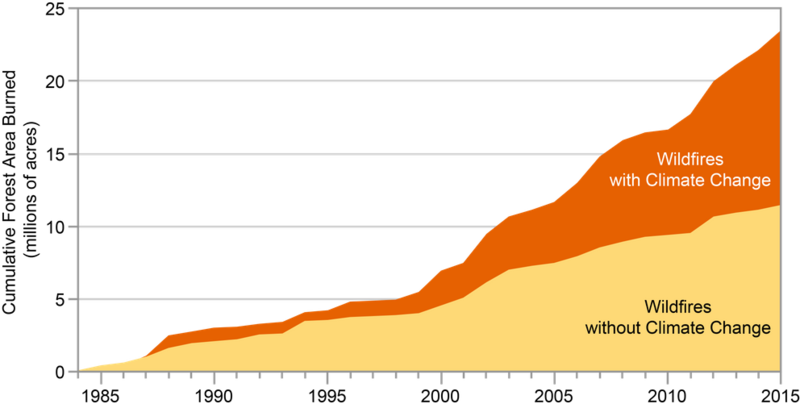 “I would love it if we could get off the debate over whether or not this is happening or if scientists are making money off of this or all these stupid things that really prevent us from getting to the heart of that matter, which is what are we going to do to adapt and what are we going to do about greenhouse gas emissions,” Udall said in an interview Monday afternoon. He said that the West is seeing climate change unfold first hand, especially along the Colorado River, which provides water to about 40 million people in the Southwest and is key to the economy. 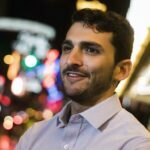 As a result, he said he thinks it’s likely that state governments in the West could take the lead in helping solve the issue. But Udall conceded that solving the problem is difficult. The report noted multiple ways Western states are tackling the issue, from collaborative water management to mandating that utilities source a certain percentage of energy from renewables. But the struggle to come to an agreement on even a short-term plan for drawing less water from the Colorado River illustrates some of the potential issues the Southwest could likely face as climate change worsens. In Arizona, a key sticking point for nearly a year has been over how to offset water losses for farmers who would lose some of their supply under a draft drought plan. As the report noted, agriculture in the Southwest used about 75 percent of the total available water in 2010 (the statistic excludes Colorado where there is non-irrigated wheat farming). As cities grow, there is likely to be increasing competition between rural and urban interests for that share of water. Despite the obstacles and many challenges that exist in mitigating climate change, scientists still stressed the importance of addressing climate mitigation and adaptation rather than backing away from it. “I think the bottom line of this report is the climate is changing, we’re driving and it’s going to get worse as temperatures warm, but there’s [still a] potential to address it,” Breshears said.